US ▼ 2013-11-26 FREE ? EU ▼ 2013-11-26 FREE ? DE ▼ 2013-11-26 FREE ? AU ▼ 2013-11-26 FREE ? 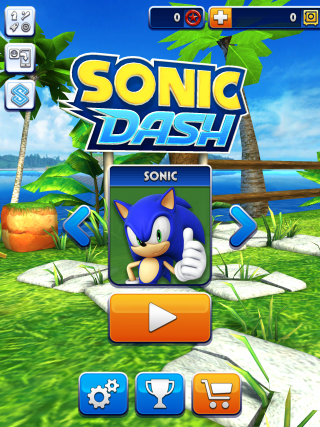 Sonic Dash is a game that is developed by Sega Europe studio Hardlight that was released for iOS and Android mobile devices. It was accidentally revealed when it was listed as one of Hardlight's iOS games on a Job posting on February 26th, 2013. The was initially sold for US$1.99, before being reduced to US$0.99 and later made free-to-play on 3 April 2013 (less than a month after release). The game is a endless run and jump type game in which Sonic runs through the levels automatically. The player can collect rings and avoid enemies and obstacles throughout the level. 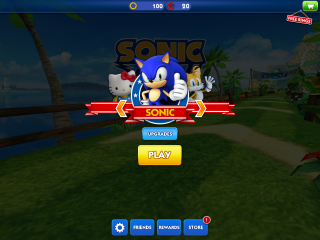 Scenarios and sounds are based on Seaside Hill and Ocean Palace (from Sonic Heroes) and changes as the player progresses. The game records how many meters the player has travelled. Game Center is supported with Achievements and Leaderboards. Shadow the Hedgehog was later added as a playable character as part of the first global challenge. Version 1.6 added two new areas: a beach (with boats around and killer whales overhead) and underwater tubes, as seen in Sonic & Sega All-Stars Racing. Blaze the Cat was also made playable through the second global challenge. Silver the Hedgehog became playable though the Christmas Festive Challenge. Rouge the Bat was later added as a playable character in the Fifth Global Challenge. Cream the Rabbit became a playable character though the Easter Global Challenge. The game includes two boss battles, against Zazz and Doctor Eggman. These fights use the music from Sonic Lost World's Deadly Six boss fights and Sonic Adventure's Egg Hornet battle respectively. 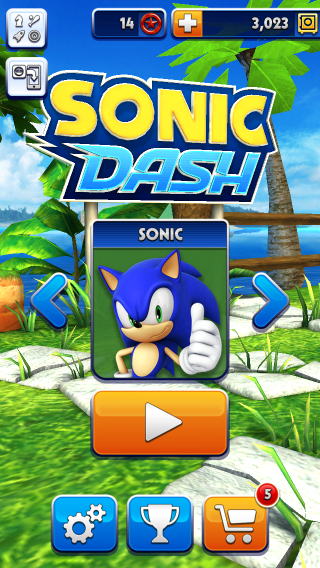 In addition to these characters, there are also exclusive and events such as Andronic the Android, a unique character of the Android version, consisting of the Android mascot with a skin of Sonic the Hedgehog. Espio the Chameleon first came as an exclusive version of Windows Phone and Amazon Fire, and was later made available to pay the other devices. Other characters include Angry Birds, which had an event shared with the game Angry Birds Epic in June 2015; classic Sonic, made available in July 2016 with a new stage (Green Hill Zone); And the Sanrio Event in December 2016, which made the characters available: Hello Kitty, Badtz-Maru, Chococat and My Melody. This page was last edited on 20 April 2019, at 12:42.